Leeds University open day, gifts from Glamour magazine, Winchester, Derbyshire cottage holiday, Alton Towers Scarefest, Mulberry card holder, me wearing my cossack hat, Nandos, Topshop beaded cami, my new Zara coat, Starbucks Gingerbread Latte, Kooples jacket, first time watching Devil Wears Prada, new polishes, new riding-style boots, Essie in 5th Avenue, sunny Bristol, Space NK delivery. I have been such a busy bee! Juggling my school work, UCAS application, blog and social life at the same time has been pretty manic... Here's some things i've been up to since my last little Instagram post (possibly a good few weeks or months ago). 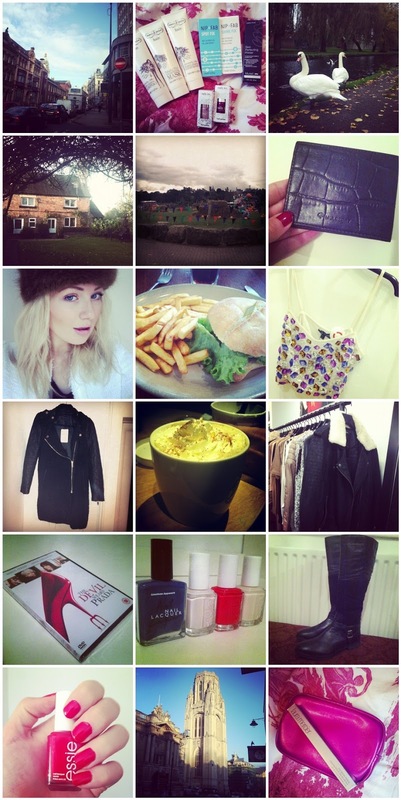 And because it's been so long since I shared some photos with you, the grid might be a little longer than usual! I've also got lots of ideas for posts in my head but it's finding the time to do them that i'm finding particularly challenging. Also, i'm just over 20 followers from doing a 100 follower give away! I would really appreciate anyone spreading the word or sharing my blog link via twitter etc. The coat is beautiful! I just have to say that I LOVE your blog it's gorgeous, I'm following.